High Quality Content by WIKIPEDIA articles! 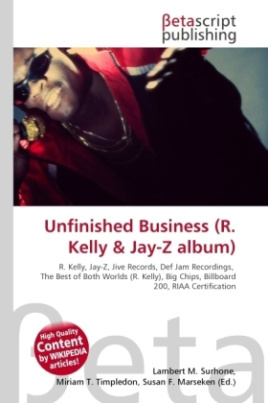 Unfinished Business is the second collaboration album between R&B artist R. Kelly and rapper Jay-Z and was released worldwide on October 26, 2004. It was distributed in the United States and Canada by Jive Records and Island Def Jam Music Group. by the Bertelsmann Music Group (BMG) and it's subsidiary Jive Records, except in Canada and the United States of America where Island Def Jam Music Group and it's labels Def Jam Recordings and Roc-A-Fella Records replaced BMG. The album was composed of unreleased tracks from the recording sessions of 2002's The Best of Both Worlds, although slight additions were made.